In total these paths make up an excursion network of some 25 kilometres. 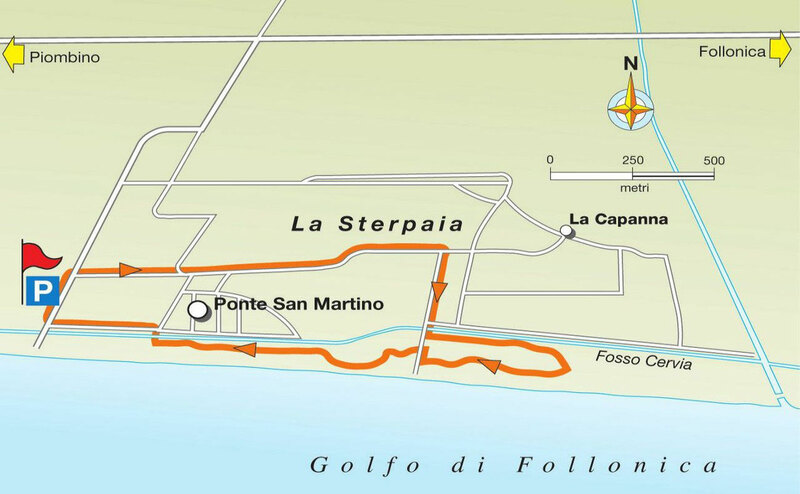 The coastal way of the Cavaleggeri, running from Piombino to Populonia, is an integral part, as is the ridgeway track from Populonia to Piombino, which passes along the Reciso crest of Monte Massoncello. There is the Monastery Way, leading from Reciso to the monastery of San Quirico, and that going from the monastery to the small bay of the same name, which once served as a landing stage for the monastery itself. There are pathways going from Diaccioni to Fosso alle Canne and from Diaccioni to the beach of Spiaggia Lunga, and the historic Cavaleggeri trail from Baratti to Buca delle Fate. 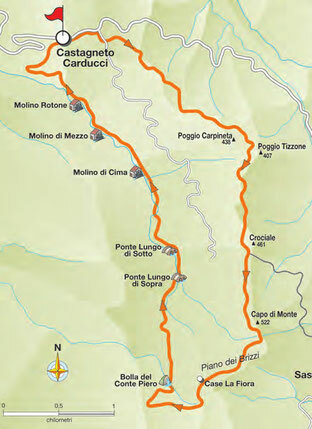 In addition to these, thematic circuits are foreseen, with an archaeological route linking Buca delle Fate and the Etruscan necropolis to the monastery of San Quirico, a bridlepath from Piombino to Populonia along the ridge, a school route and a historical route. These pathways connect the ancient Etruscan city of Populonia with the modern city of Piombino, reinforcing a link that has existed throughout history for more than two thousand years. The route of the visit within the centuries-old wood of the Sterpaia, which can be visited with a guide and only on established paths to avoid indiscriminate trampling, has a circular direction and covers all the emerging plant-life of the park, illustrated in part by information boards along the way, and in part described by the guide. An invitation to meditation and reflection is offered also by the so-called "artistic signs" situated in the most characteristic and thought-provoking places in the wood, and comprising 9 works, produced through bronze welding, by the Florentine sculptor Marcello Guasti, each one characterised with a short poem. 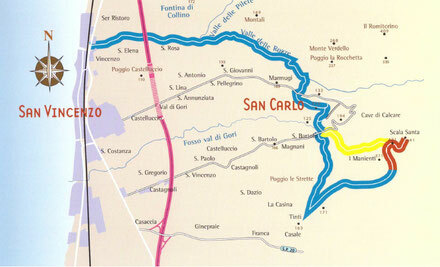 The routes described in this map involve the whole municipality of San Vincenzo. Moreover, they link the sea to the so called massif of Monte Calvi, which is 646 high and therefore the second tallest chain of the area. The first one is Monte Capanne in the Island of Elba. 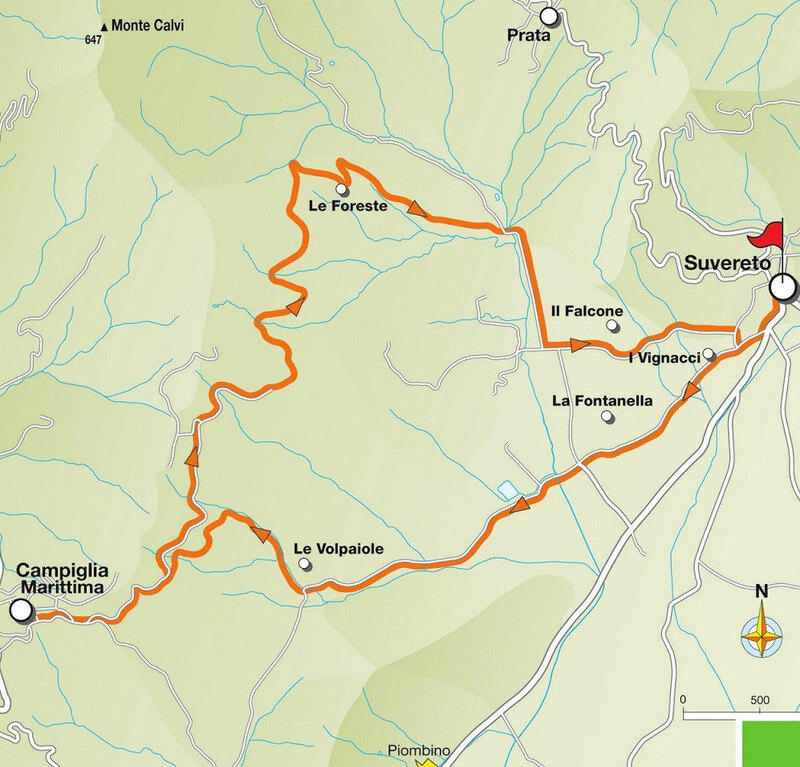 These routes are particularly suitable for hiking, because they reach an area endowed with a wild and unblemished nature. This wonderful background surrounds many historical settlements which date back to the Etruscan time, the Medieval one and the period of the last mining activities (1900). The Forest Park of Poggio Neri, which is part of the Agricultural Heritage Regional called " Sassetta " which covers a total area of 735 hectares , is situated to the east of the country to reach the valleys of Lodano and Massera and is an ideal destination for lovers of trekking , horse riding and mountain bike excursion . 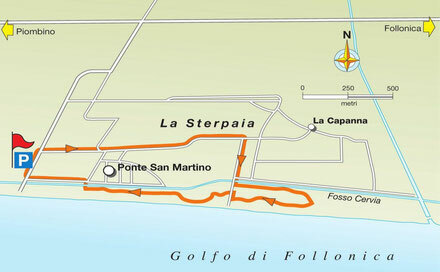 In the park there are 37 km of well equipped paths between splendid specimens of chestnut and oak . The park is also the Museo del Bosco : an exhibition in the open air of the tools of the trade of wood and a perfect and meticulous reconstruction of the world of coal miners. Here the ancient charcoal burners of Sassetta wrote their stories of life in harmony with nature . Through a choice of five hiking trails, or by means of transportation in the Park, you can reach the medieval Rocca San Silvestro, emerging from a rock, isolated and surrounded by the valleys of Lanzi and Manienti. Its strategic location is perfect, overlooking kilometers to the valleys below, especially the areas of mineral deposits. 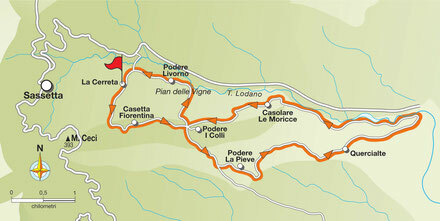 The Temperino Route, The Ferruzze Route, The Lanzi Route, The Manienti Route, Via delle Fonti. 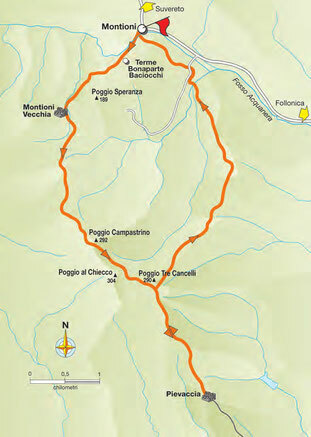 From Montioni, starting at La Foresta, begins the path of Poggio Saracino. In the heart of the park the signs of man emerge from the remains of alum quarries and the mining village of the Napoleonic era built by Elisa Bonaparte Baciocchi, Napoleon's sister. 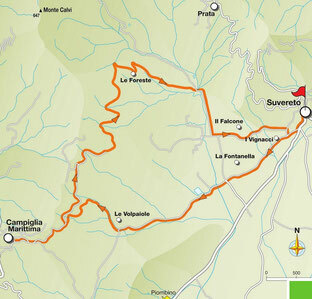 12 Km distance (a / r) for about four hours on foot or 2:30 in Mtb. This itinerary offers the opportunity to immerse themselves in an atmosphere designed by nature and by human hands: vineyards and olive groves, ancient marble quarries of Campiglia, dense Mediterranean vegetation and an unforgettable panorama that sweeps from the coast, the islands and Mount Amiata. It is a very nice link that runs between Suvereto and Campiglia Marittima, two medieval villages that deserve a journey and views to be savored at a slow pace. 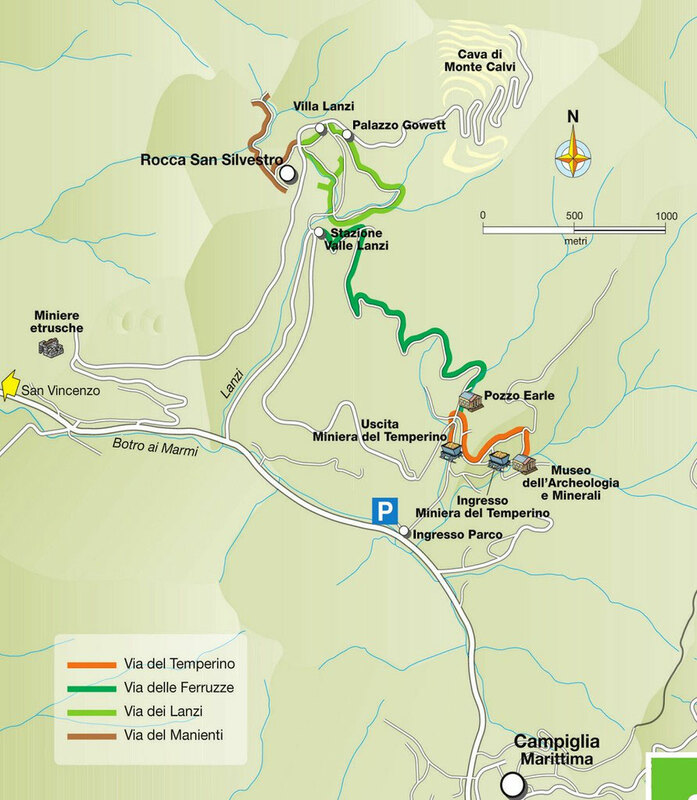 This route through the hills of Castagneto Carducci and Sassetta offers the perfect synthesis of a territory able to harmonize the sense and the spontaneity of nature with human activities. 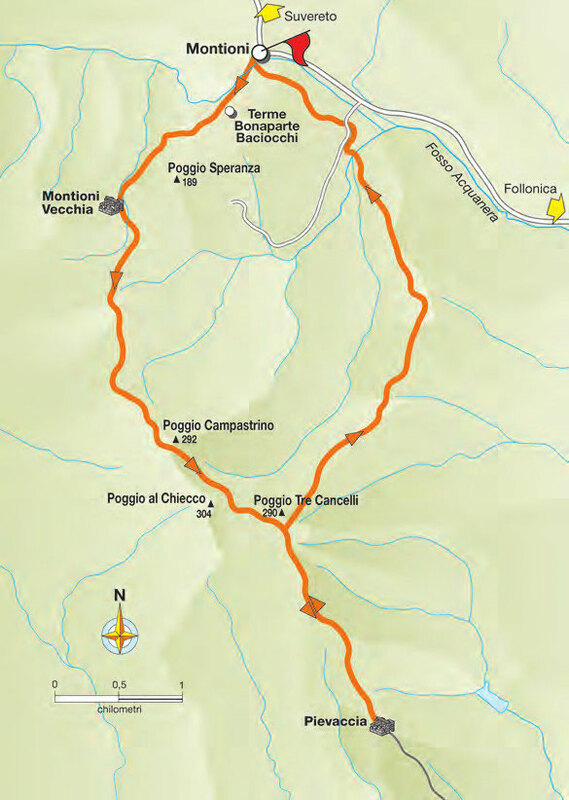 The first part runs along the ancient Via Campigliese, important communication road between Castagneto and Campiglia while the second part will follow the Valle dei Molini. You walk into the bristly scrub and dense to the point of appearing impenetrable, it can feel the atmosphere of the chestnut forests for centuries irreplaceable sources for the daily nutrition of the locals.